Doesn't this look fabulous? It was! Very dense and moist with a great crust. This recipe is from A Little Irish Cookbook from Appletree Press. This recipe is a keeper! I've added my comments with brackets. Holy smokes was I surprised by these little crocuses. They certainly added to the excitement of the unseasonably warm weather we are having! Today it is supposed to be 70 F!!! So, all plans for an Irish meal have been thrown out and we are having brats on the grill with our friend Betsy. 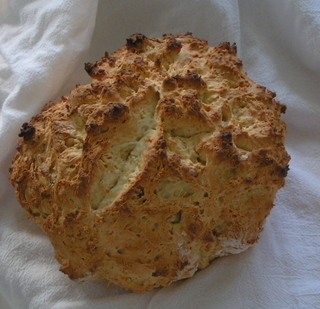 I may sneak in some Irish Soda Bread, though. Perhaps some scones if there is time. The leprechaun trap worked in the sense that he dropped some of his gold but we didn't nab him. In fact, he played a trick and changed his gold into gold foil wrapped chocolate! So on a rainy, cold Wisconsin day, what could be better than a warm breakfast? With a little help from Midwest Living's Mix and Match Muffin recipe, I came up with this concoction. If you don't have whole wheat flour, don't sweat it. 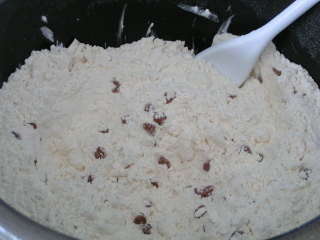 Just use 1 1/2 cups all purpose flour. Don't want oatmeal? Just use 2 cups all purpose flour. Buttermilk not in your kitchen? Just substitute an equal amount of milk. Have fun making muffins to suit your taste! The recipe is how I made it but In brackets, I have put possible substitutions. Today I made my little cowboy a mail carrier bag. We went to the Betty Brinn Children's Museum last month and Aidan got a kick out of mail sorting and delivering. For the last month, I've been saving return envelopes I've received in the mail for us to repurpose. I also spent a little time researching how to make this bag. I finally found a tutorial that I based my bag creation on at Craftster. I used fabric from my stash - I think it is Robert Kaufman and it is a lightweight corduroy. I took pictures and notes along the way as well as measurements for this particular bag. If anyone is interested in a tutorial, please let me know and I'll put one up. This was fun and sewed up quick once I had the measurements.